I'm childishly in awe of spaghetti squash. It's almost magical how the squash so easily shreds into pasta-like strings. I can imagine an infomercial with a very loud and aggressive host displaying the wonders of the squash and me, all wide-eyed and open-mouthed, gasping, "Wow! That really works! Looks just like spaghetti! I'm really amazed"! Like substituting mashed cauliflower for potatoes, spaghetti squash can be a great substitute for pasta, a perfect bed for just about any sauce. Like mushrooms, the squash happily accepts the flavor of whatever you choose to marry it with. When I have one of those "experimental whims" I'm likely to test them out only for myself. If they're a hit, I might share them. But usually, they're not. Usually, I get a "Not bad." This is not, however, an easy- to-do weeknight kind of dish. It takes time to cook the squash. Takes time to shred the said cooked squash. Time to mix the patties and time to cook them. The good news is that they can be frozen without losing anything. Just a warm-up either on the stove top or in the oven, and they're ready again. Combine all ingredients and mix till well-combined. Heat a small amount of olive oil and a tablespoon of butter in a skillet over medium high heat. Drop squash mixture by heaping tablespoonfuls and cook for a few minutes on each side until golden brown. Serve with the cilantro yogurt sauce. Stir all the ingredients together, adding salt to taste. Chill to let flavors blend. Bring to room temperature before serving. I love the simplicity of this dish Rosemary. I remember the first time I ever saw spaghetti squash. I was in awe too, and to be quite honest, I still am. I can't wait to give this dish a try. I just loved the curry, Karen! What a pretty presentation Rosemary. I'm fortunate my husband is very experimental, but I have a couple of friend's spouses that are all meat and potatoes men. At least your husband will give it a try. He's a pretty good guinea pig, Sam. I'm pretty lucky. These make a really nice side dish, too -- or a whole meal for me somedays! These look so good! please post about your mac and cheese with lobster; sounds decadently yummy; thanks for your visit. Next post, Rita . . . Promise. I am not a huge squash fan, but I ADORE spaghetti squash! Your fritters sound amazing, Rosemary! I am a sucker for anything squash! These patties are right up my alley! I didn't as a kid (I'll be kind to young people) but I love any kind of squash now! I love spaghetti squash too. My mom used to make it for us...and it was always my favorite. These patties look like an excellent twist on a family classic. Thank you for sharing! I never had spaghetti squash growing up, Monet. (Must have taken too much time!) These patties are a fun twist. You're right about the spaghetti squash patties not being weeknight quick. But could the squash be cooked and shredded the night before and then made into patties quickly? Also, the cilantro yogurt sounds like it would be perfect for topping salmon fillets or other quickly cooked fish. I'll have to give that a try! You're right, too, Terry -- anything you can do ahead, I'm all for. I hate to sit down to eat exhausted! (Even though I love cooking!) This is worth it. Squash patties? Those sound so good! And your photos are absolutely gorgeous. Thanks, Beth. 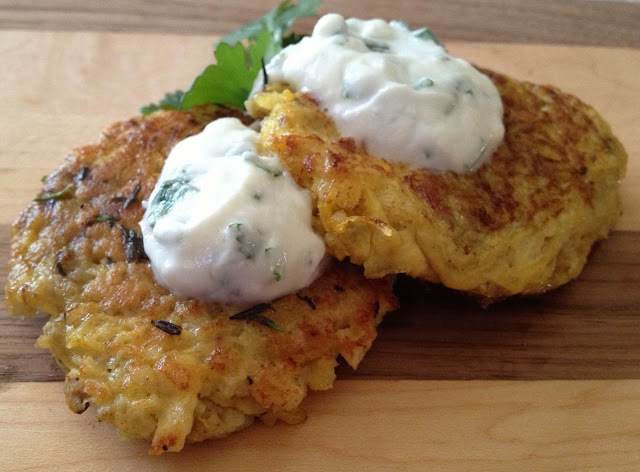 The squash patties are a great way for me to cut down (a little, anyhow) on carbs. What a great idea! I am always looking for tasty spaghetti squash recipes and this looks like a winner! I like these patties, too, Amy. Even though they're both "squash" I think these have a meatier texture than zucchini patties. Oh how I love how you added the cilantro yogurt to dip these in, Rosemary! I can just taste it from here! I hope that you are having a lovely Christmas season! I'm still on the fence about using much cilantro, Roz, but it was perfect with these. BTW, I love your new "Deliciously Italian" group board on Pinterest. Thanks for starting! Rosemary, these little patties are gorgeous but really loving the cilantro dip. MMmmmmmmmmmm! I'm also amazed by this kind of squash! These look pretty darn tasty! Pretty funny being this grown up and still in awe of a vegetable! You should have seen me the first time (last Weekend!) that I opened a pomegranate! The patties look great, especially with yoghurt on top. Spaghetti squash doesn't seem to be as common in Australia, or maybe I just haven't been paying attention. Would love to play with it someday though! Ah, yes, playing with food . . . that's how all this started, right, leaf? What made these special to me was the curry, kale . . and the cilantro just seemed the right go-along. This is brilliant, can't wait to try them, I must invite my daughter over though because she will go bonkers over these! I hope your daughter likes them, Marie, as much as I enjoyed your roasted vegetable torte . . .
What a great way to use Spaghetti Squash. At first I thought they were potato pancakes (latkes) but this is even better. How fun! I'll have to try this. They are like latkes, Vicki. I had fun making them. BTW, I made a vegetable torte over the weekend, and I looked at your pastry covered one . . . I opted to go "naked" but next time, it will be swathed in dough! Count me in Rosemary. Spaghetti squash is the only squash my mom enjoyed so subsequently the only squash I new growing up. Lucky you, Val! It must have just taken too long to cook, 'cause we never had it growing up! How lovely to come across something savory! Love the curry in it and the yogurt dip is the perfect accompaniment. Merry Christmas, Rosemary! May your days be merry and bright! Thanks, Claudia . . . you're the best. A great cook, a caring and thoughtful person. The best combination. Merry Christmas to you, too! Dropping by to wish you and your family a very Merry Christmas and the best of new years. And a happy ne year to you, Sam! I completely love spaghetti squash too--the color and texture are fabulous. What a great use for this veggie! Squash patties sound delicious. And the cilantro yogurt is a perfect addition. I just love this recipe Rosemary, especially the cilantro yogurt! How creative! I pinned it for you under my board on Pinterest, "Eat Your Veggies" with proper credit to your blog. This way I'll know I've got your recipe to return to instead of trying to hunt for it! It's a winner! I wish you the best of new year's dear friend!